Take a look at the most famous Duck Tour in the world. From the historic homes of Beacon Hill to the shores of the Charles River, Boston is a city known for its colonial history and quirky artistic charm. 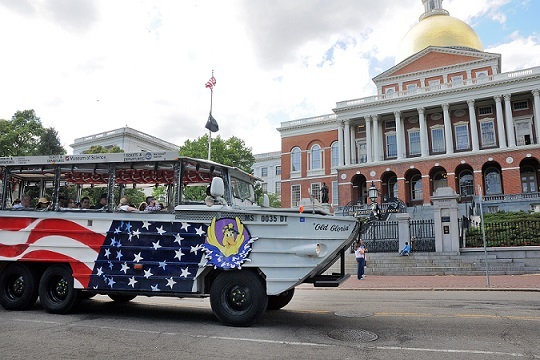 Not a season goes by without catching sight of the famous duck boats of the Boston Duck Tours, giant amphibious vehicles capable of traveling by both land and sea. 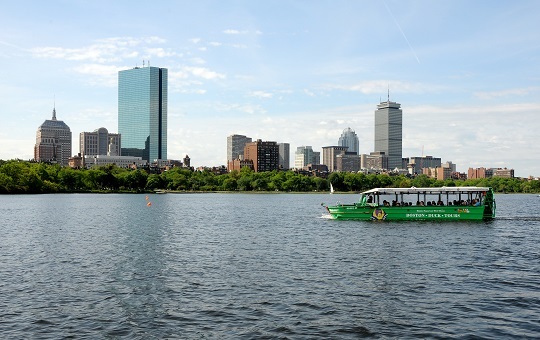 For those who are repeat customers, each Boston Duck Tour is different depending on what tour guide you are traveling with. “My favorite part of the tour is the crews and the river,” says Schwartz. Each tour conductor, or ConDUCKtour as they as fondly referred to, offers a unique look to the tour. ConDUCKtors give tours in character with their own original tour guide character creations, including Scott Milk?, The Cod Father, Jam Adams, M. T. Buckets, Paul Reverse, and many other colorful characters. Schwartz can share some colorful stories about the duck tours as well. “One year a fraternity was hazing one of their students. They dared one of their brothers to jump off a duck and swim to shore,” says Schwartz.